My friends and I have a “potluck” almost every Saturday, and I am usually in charge of desserts. I remember one weekend,, my friend Brittany’s husband wanted brownies for his birthday. Brittany informed me that he prefers a fudgy brownie recipe, so I should follow the recipe for the fudgy version on the back of the box. “What box?” I asked, since I make most of my desserts from scratch. 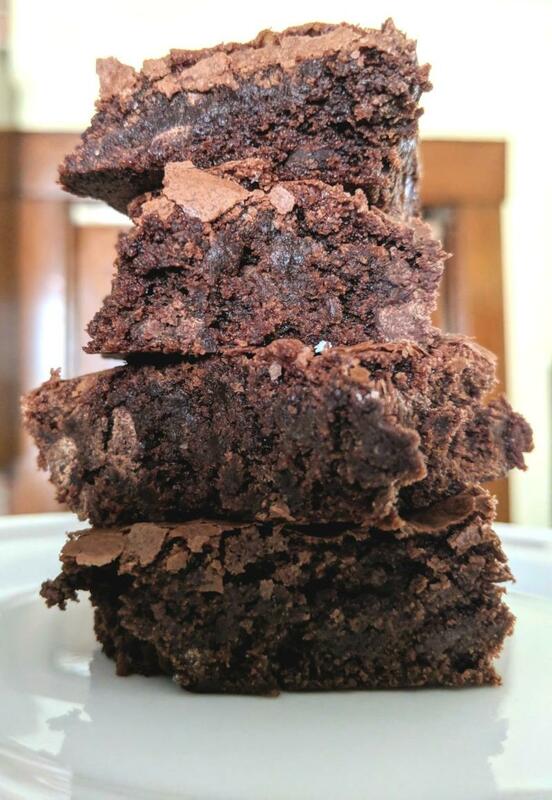 It’s become an inside joke, and this particular brownie recipe has been a hit ever since. So what’s with the “voodoo”? The title actually comes from my friend Kristina’s husband. He took one bite, then accused me of using voodoo, because, he said, it was like he had been transported to a chocolate fountain. 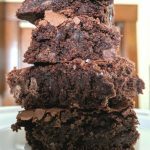 I promise that there’s no voodoo involved with this delicious fudgy brownie recipe, but your friends might think you’ve added a little something extra to these brownies when they take their first bite! For those of you who don’t know, I’ve started an Instagram story that follows Kylo Ren and Rey from the new Star Wars trilogy. (Spoilers! Seriously, if you haven’t seen The Last Jedi yet, go see it!) Kylo’s taking time off from being Supreme Leader to teach Rey the ways of the kitchen when she’s not busy being the last Jedi. This is their second baking adventure. Follow me on Instagram (molly.becca119) to follow along with their baking adventures, or follow the hashtag #bakingwithkylorey. Kylo: Are you ready for your next lesson? Preheat your oven to 350 degrees and grease a 9×13 pan. First, combine cocoa powder and baking soda in a large bowl. Stir in half of the butter (1/3 cup), then the water, and stir until the mixture thickens. After your mixture thickens, stir in sugar, eggs (one at a time), and remaining butter (1/3 cup) until smooth. Add the flour, vanilla, and salt to the batter and stir until combined. Finally, stir in the chocolate chips. Pour batter into pan and bake for 30 minutes. Rey: Are you kidding me? We’re still not making cookies? These brownies are great for sharing with friends or keeping to yourself (hey, there’s no judging here!). If you do happen to share them with friends, let me know if anyone accuses you of using magic. Rey: Okay these are pretty good. 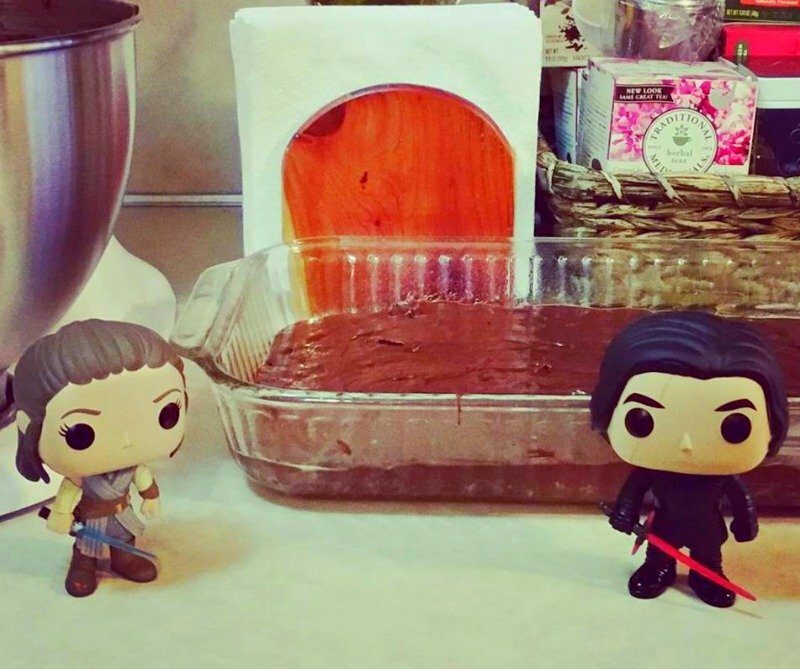 Don’t forget to follow me on Instagram (molly.becca119) to follow along with Kylo and Rey’s baking adventures! I’ve included the images, but only a little bit of dialogue. You can read their full conversations by visiting my Instagram and clicking on the images. You can still visit my Instagram even if you don’t have one of your own. 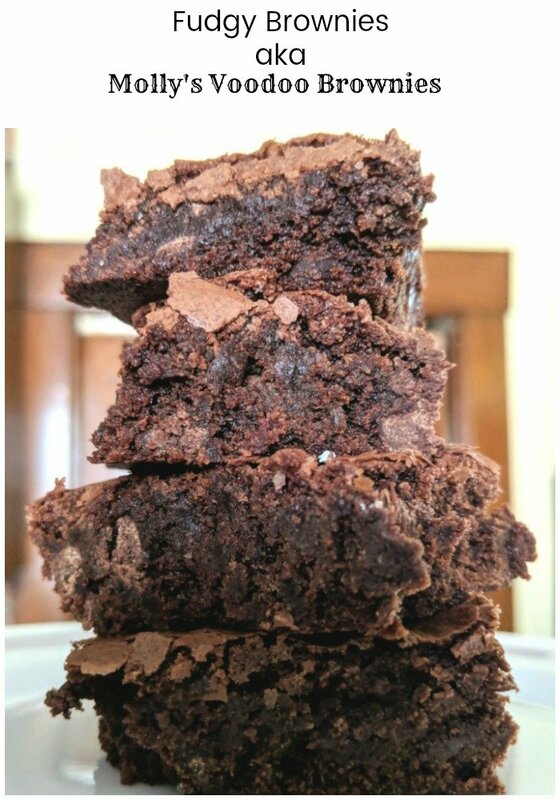 These brownies will have your friends and family thinking you've performed magic while making them. They are chocolatey and delicious. So cute. 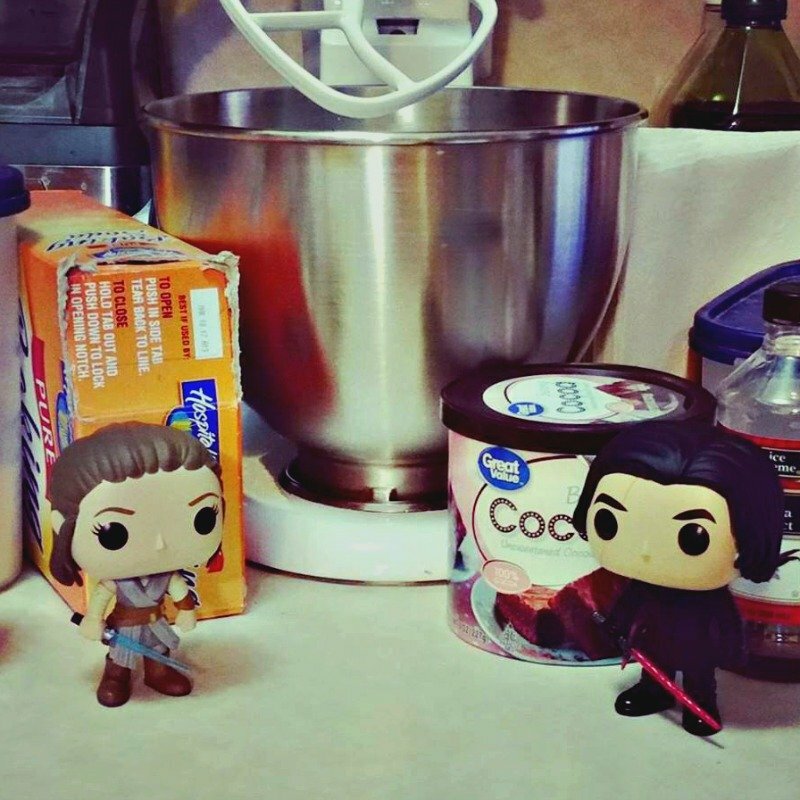 I love that Kylo and Rey are the baking buddies. 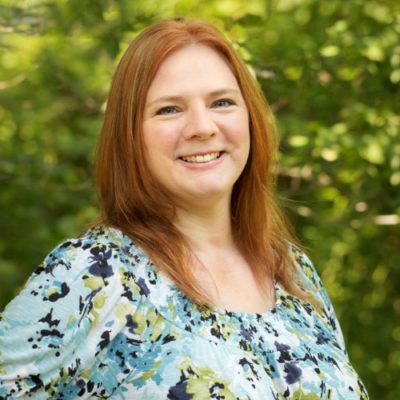 I’m actually not a brownie lover–I know scandalous. Until I had the best brownies ever, then life changed forever. These recipes sound great. I’m a box mix kind of gal. I substitute the oil for olive oil and add a half cup of chocolate chips–and I’m in heaven. But I need to try these amazing homemade recipes and explore my horizons. Molly’s friends do swear she is magical lol! 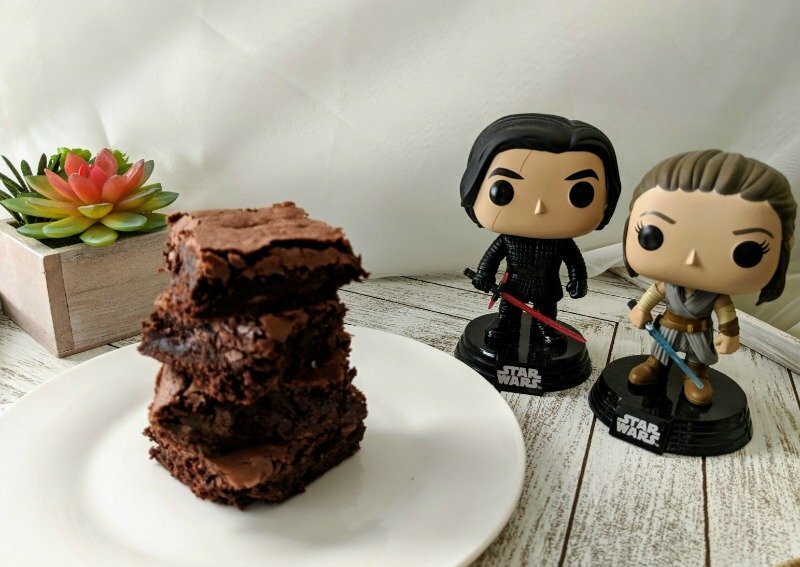 She’s having fun with her Kylo and Rey baking adventures!